If you are aiming for a more natural, self-sufficient life, want to save money, and be in charge of your own health, it’s time to start making your own laundry detergent. It’s so easy! And fast! Most store-bought laundry detergent is full of weird ingredients, some of them known cancer causing agents, filled with chemicals and unhealthy fragrances. Even when you buy the “natural” stuff, it’s loaded with many unrecognizable ingredients. Optional ingredients are essential oils like tea tree oil and lavender, or lemon if you like that smell. If I were really dorky, I would do the math and figure out how much cheaper this is than store-bought laundry detergent. All I can tell you is it saves you a lot of money. I have a family of five, including two very, very active teenage boys, and one tom-boy girl, and we have a homestead with lots of dirt, mud, grass stains, dust, sweat, birthing fluids, manure… you get the picture. I do a lot of laundry. A five gallon bucket like this lasts me two months, and it costs mere cents to make. In terms of cleaning power, this stuff works. Our laundry gets clean and smells fresh. I use little scraps and trimmings of my own home made goat milk soap, but you can easily get Dr. Bronners or Fels Naptha soap. 1. Grate one bar of soap (about 5 ounces) with a fine grater, or even do it in the food processor to chop the pieces nice and small. 2. Put these small soap pieces in a pan with 2 quarts hot water and stir constantly so the soap dissolves completely. 3. Put 4 gallons of hot water straight from the tap into a 5-gallon bucket. 4. 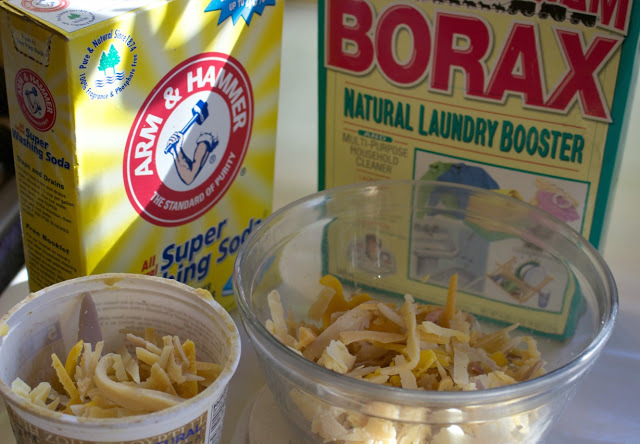 Into this bucket with hot water, stir in 2 cups of borax and 2 cups of washing soda until it’s all nicely dissolved. 5. 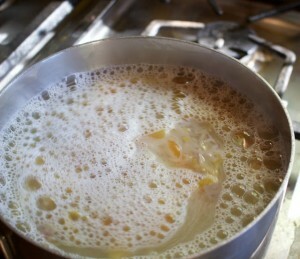 Put the dissolved soap mixture from the pan into this bucket and stir well. If you want to, you could now add a few drops of essential oils. Lavender and tea tree oils are nice, because they also have antimicrobial and antibacterial properties and smell good. 6. 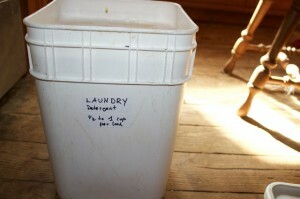 Label this, cover the bucket and leave it sitting overnight. 7. Stir or shake it up every time you use it. Use 1/2 cup or 1 cup per load. That’s it! I told you it’s fast and easy, didn’t I? Why don’t you whip up a batch of this and let me know how it works for you? Corina Sahlin homesteads in Marblemount with her family and offers online courses through her website. For more information, see www.marblemounthomestead.com. Thanks for this article! Do you know if this recipe is safe for high efficiency washers?